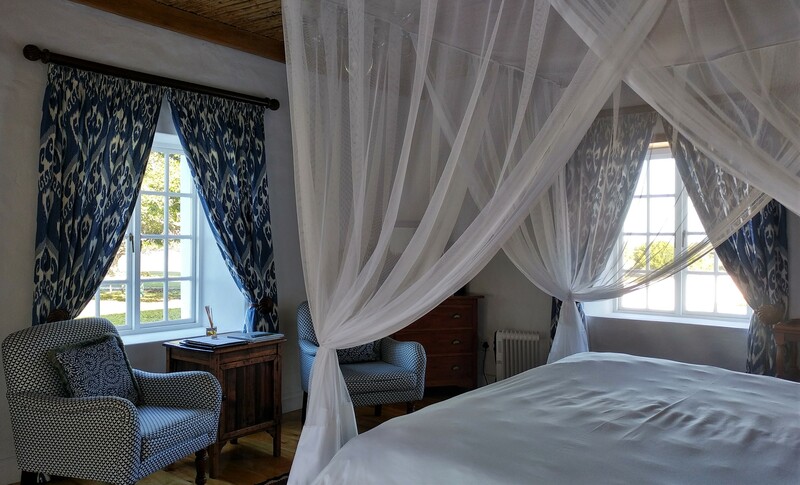 A winter retreat to the luxury reserve at De Hoop. In the silence of this remote wilderness the colours shout out loudly. 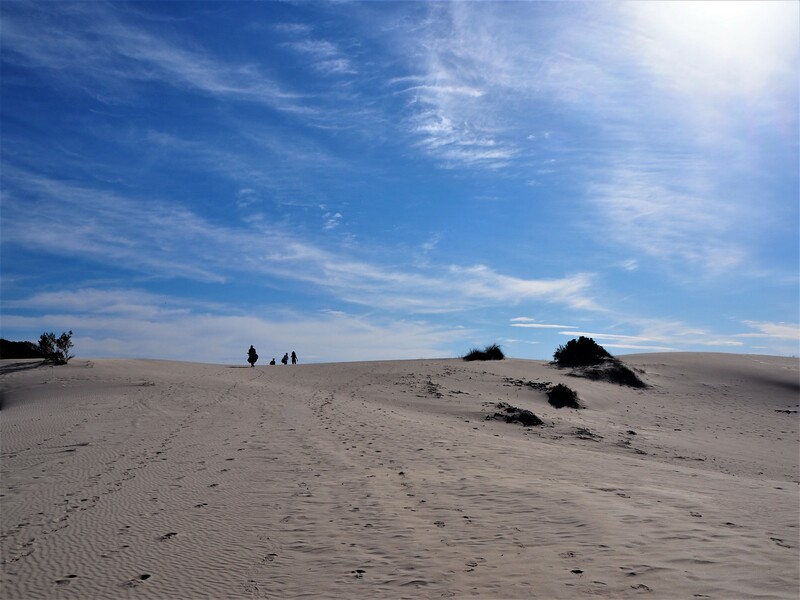 De Hoop in summer is a dry landscape of earthy tones but winter compensates for the cold temperatures with vivid colours, new growth and dramatic clouds. The fields of canola approaching the reserve scream in bold yellow. They demand that you stop and admire their show. 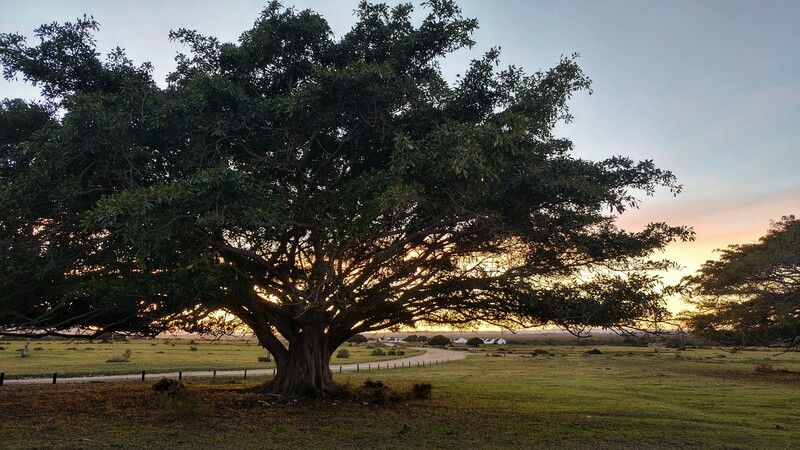 As you leave the yellow canola behind and crest the hill for the first view of the vast expanse of the De Hoop Reserve, stop for a moment and consider the huge variety of wildlife that calls this place home. The stone and whitewashed buildings you see clustered around the vlei is just a fraction of this reserve. For a complete bird, mammal and marine guide /check-list for De Hoop, click here. Forget about the Big 5, you will not see them at De Hoop. 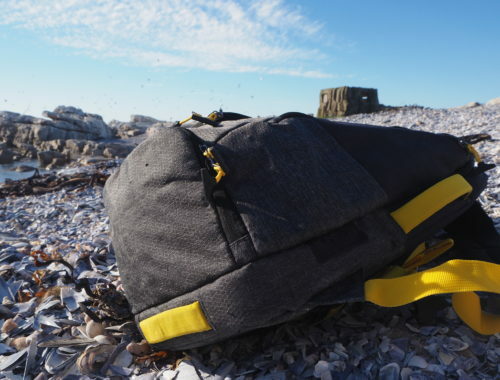 This means you can safely walk, cycle, hike and explore without the fear of being eaten, mauled or chased and allows you to have a fully immersive experience in nature. When the Big Five are around it is the norm to stop looking for anything else, but the bush has got so much more to offer when you allow your senses to fully focus on your surroundings. 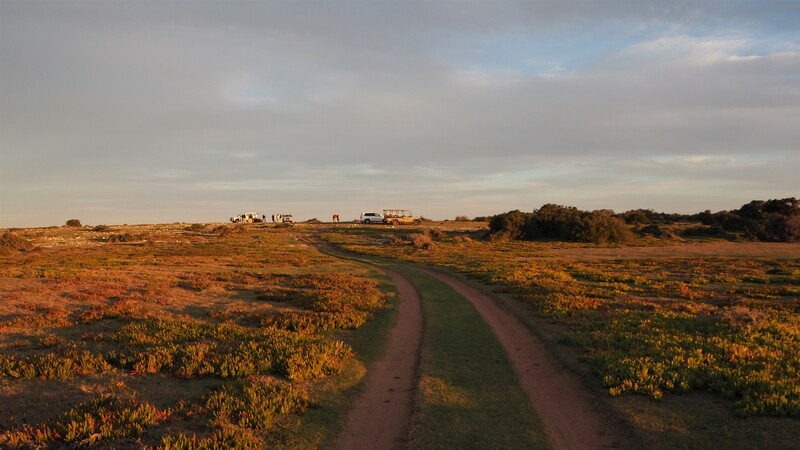 Around the accommodation area you will encounter Cape Mountain Zebra, Bontebok, Kudu, Eland and Chacma Baboons, all delightful to observe and photograph. You can probably view them from your room. My home at De Hoop, the Cloete Suite. With a bit of effort and a walk or a drive you might get lucky and see a Caracal, African Wildcat, Large Spotted Genet or even a Leopard. We cycled to Dronkvlei for sundowners and the staff setting up the drinks and snacks told us we had just missed a sighting of a leopard. Dronkvlei means Drunk Lake if directly translated, I need to find out the story behind this name. 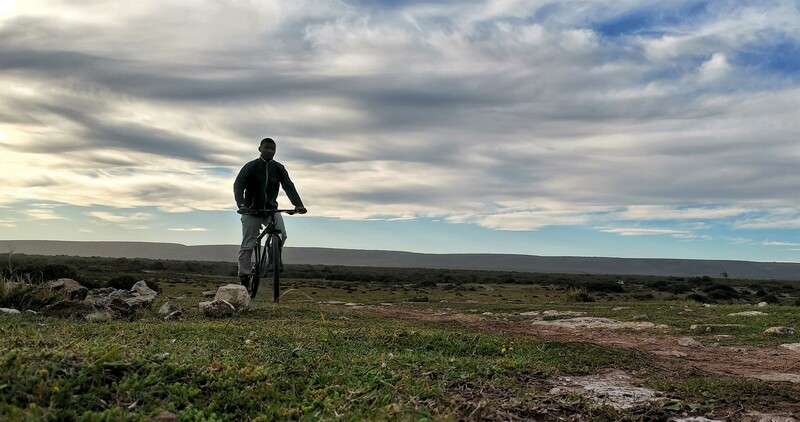 Riding into the sunset at De Hoop. Don’t forget to look down for the little guys like the Small Grey Mongoose, Cape Hare, Porcupine and various gerbils, shrews and mice. For birders, a guided walk in the early morning can be arranged or you can go out alone and keep an eye out for the Black Oyster Catcher, easy to spot down at Koppie Alleen beach, Damara and Caspian Terns, Blue Crane, Stanley’s Bustard or any of the 260 bird species on the reserve. At night look out for any of the six species of owl. We heard one but were unable to spot it. Last light out in the veld at the De Hoop Reserve . The Cape Vulture is an endangered species but thanks to De Hoop, Cape Nature Conservation and the local farmers working together, the last remaining colony in the Western Cape is growing and now numbers some two hundred birds. Forget the cartoon picture in your mind of vultures. 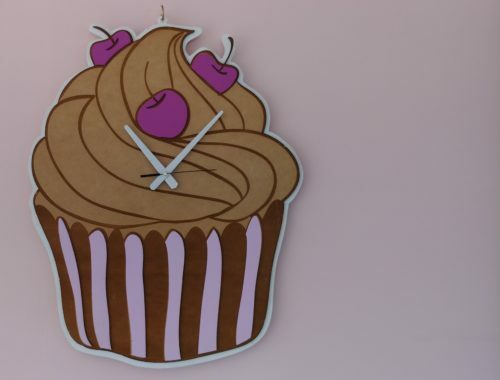 They are usually depicted as scruffy gangster like birds with scrawny necks hanging out on cliffs looking for trouble. They are the victims of really bad press, and De Hoop now offers an extraordinary experience to see these birds in full flight. We started out with a drive through the reserve to the Cape Nature offices. 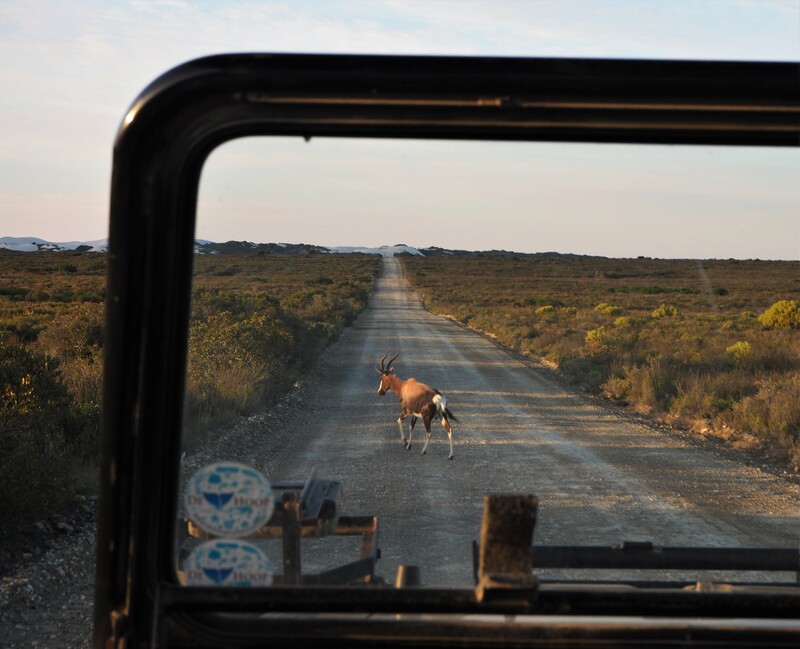 No traffic on these lovely roads in the De Hoop reserve. From here we got down into nature as we walked along a narrow path through the fynbos which was just starting to show off it’s spring colours. Arriving at a little clearing, shaded by trees we refuelled with coffee and rusks while eyeing the slightly daunting incline we were about to tackle. Sun bleached rocks provide footholds and stepping stones as we make our way up the Potberg Mountain. Regular stops are made by some of us to admire the views and catch our breath. Mostly to catch our breath, but admiring the view or taking a photo is a good excuse for us to give to those powering up ahead like mountain goats on speed. 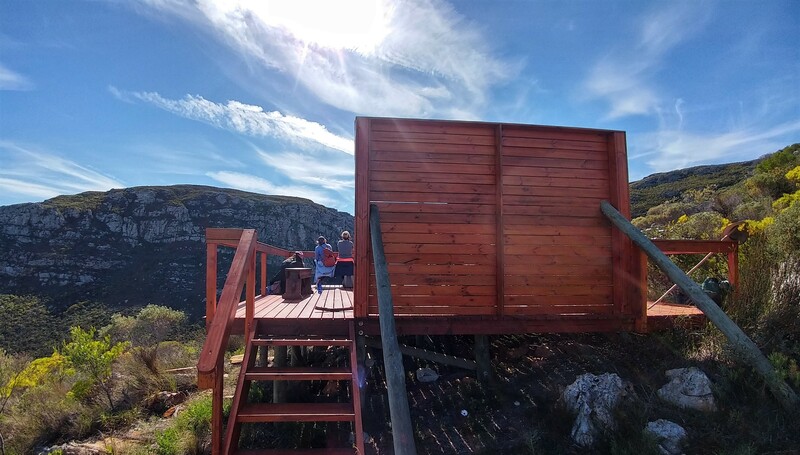 The wooden viewing deck looks across to the cliffs where the Vultures nest and the gorge where they catch the thermals and soar out over the valley below. Sit and watch the vultures soar. With a wingspan of over two meters these birds look exquisite in flight. The are graceful, powerful and fast. They are also extremely difficult to photograph, I failed horribly, but take a look at Peter Chadwick’s vulture pics and here at Kate’s post for great pics of the De Hoop Reserve. We stayed on the deck for well over an hour, watching, pointing and delighting at these beautiful birds. We counted over forty two of them in the sky, and by staring or using the binoculars we were able to spot others in the cracks and crags on the cliff opposite us. The walk down is pleasant and obviously much quicker. Back at our rusk and coffee spot we were treated to a lunch spread of extreme deliciousness accompanied by wine, juice and water. This activity is dictated by the tides and we were up and ready to go at 7am to make the most of low tide at Koppie Alleen beach. 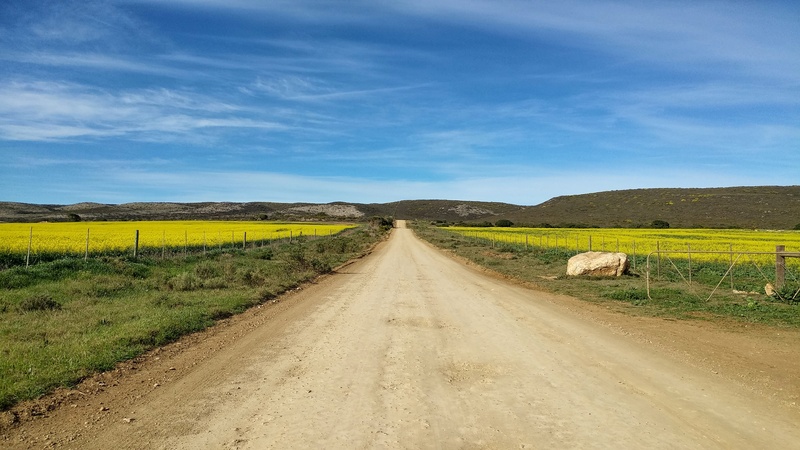 It’s about a twenty km drive on a bouncy dirt road from the De Hoop Collection village. The beaches here take my breath away every single time I visit. There is so much going on it would take days of exploring to take it all in. The perfect beach at Koppie Alleen, De Hoop. 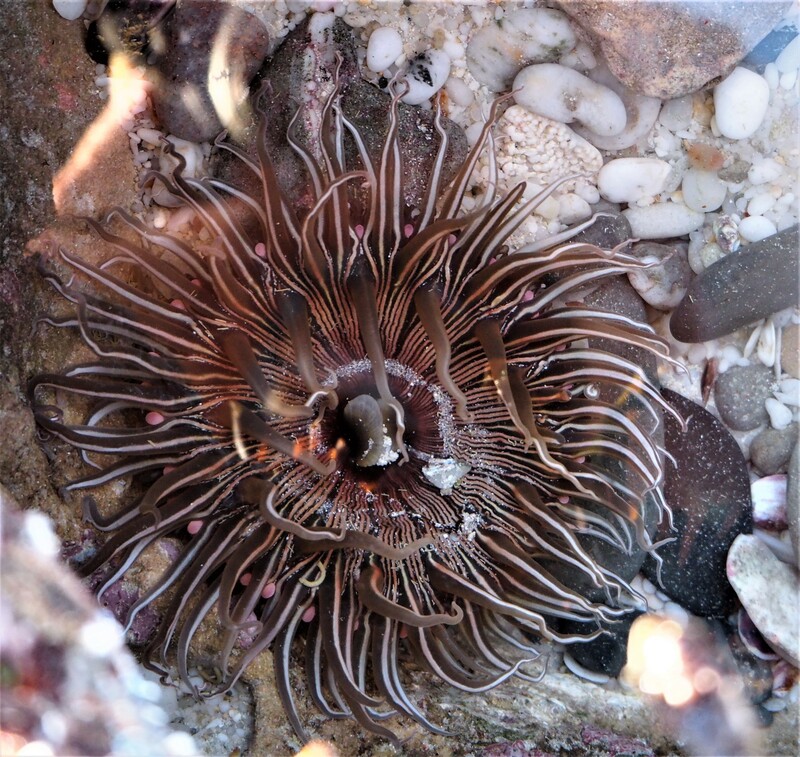 I stayed with our marine guide as she told us about the ancient two to five million year old fossilized dunes, rock formations and pools and told us stories about the urchins, anenomes and sea plants that are found in abundance here. 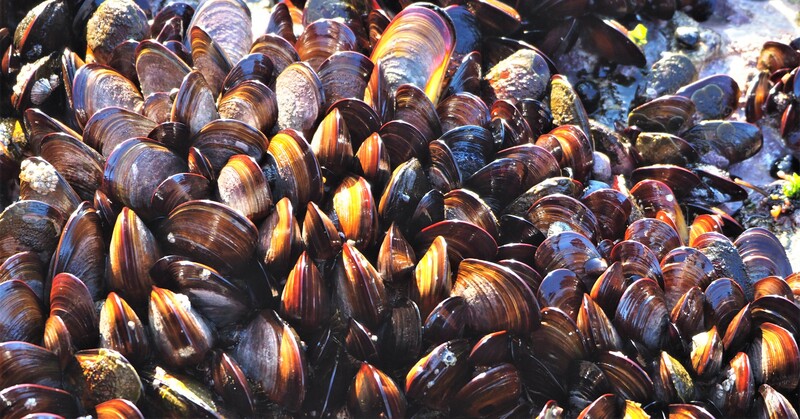 At one point we were standing on a huge bed of mussels that she estimates to be about twenty years old. 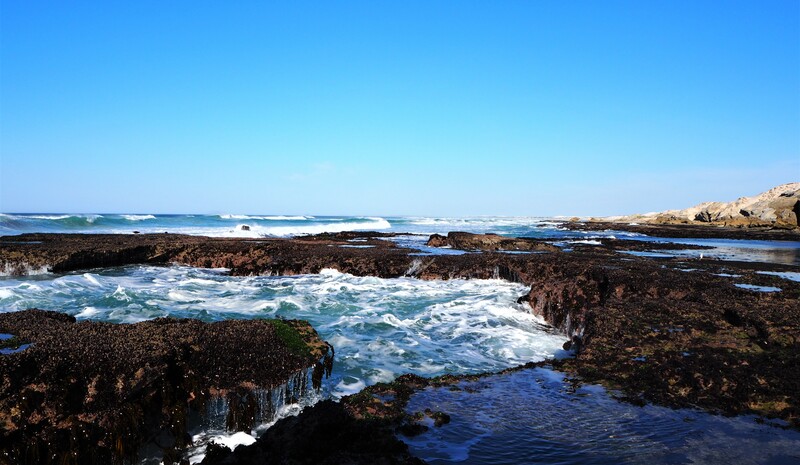 A bed of mussels cling to the rocks at De Hoop. After a while I slipped away to the other beach as I just had to sit and admire what I call the boiling cauldron. A short clamber over some rocks leads to a natural bowl where the waves roll in, swirl and crash up in a boiling fury. The power of the sea is so evident here and I find it totally compelling. Under the sea at De Hoop’s Koppie Alleen beach. We completed our beach adventure with brunch on the dunes and were entertained by the whales in the beach right below us. Sand dunes at Koppie Alleen, De Hoop. Elemis Treatment at the Spa. This was the perfect way to complete the rejuvenation I was feeling after some time in nature. Elemis have harnessed the goodness of superfoods and created a facial oil that is supercharged to give your tired skin a new lease on life. An hour long massage of the body involves brushing, massaging and wrapping, before a warm shower followed by a short snooze in my case. The facial massage starts with inhaling the scents of the superfood oil which includes extracts of omega rich broccoli, Flax Seed and Daikon Radish. Don’t worry, it does not smell like you are inhaling soup or a salad, it has a wonderful rounded, spicy aroma. I swear I could feel my skin smiling at fifty plus years of sun, sand blasting and general living were smoothed, caressed, nourished and hydrated. Using essential oils, these perfumes tap in to our sense of smell and the sensory power that this can have on our emotions. 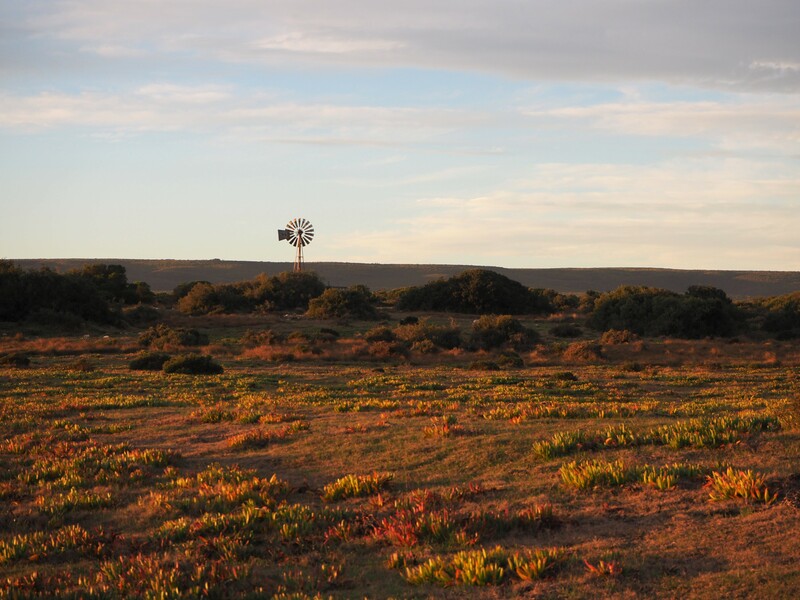 If you are looking for a break from the city, De Hoop is a comfortable 3 hour drive from Cape Town and is accessed either via Swellendam if travelling along the N2, or via Bredasdorp if you take the R316 at Caledon. 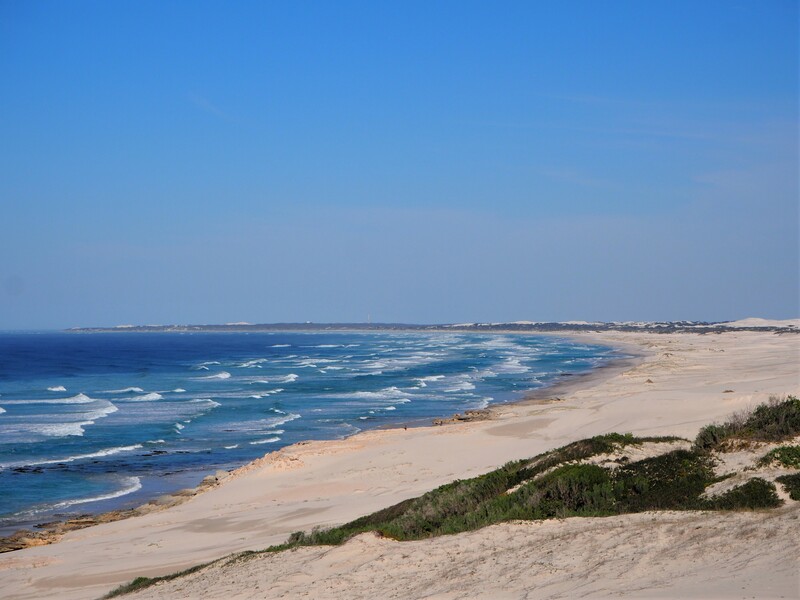 You can read about my summer adventures at De Hoop here. Thank you to the De Hoop Collection for hosting me. Indaba, creating opportunities and learning how to build a bomb. Those canola fields, ahhh! Beautiful piece and photos Di! I felt as if I was right there with you Di. Wonderful images and writing. I can’t wait to stay at this magical place next month!